Powers/Abilities: An alien humanoid who displayed no special powers, "The Chief" was the leader of an interplanetary crime syndicate (basically an interstellar "Kingpin of Crime"). He organized a network of criminals and employed beings from various planets for his lawless endeavors. History: (Astonishing#5/5 (fb) - BTS) - Doctor Karl Mantz of Germany devised a plan to explode the "cosmic atom" in such a way as to trap and condense its radioactivity into a physical substance and thereby introduce it into the human body with the ultimate result of prolonging life far beyond the normal span. Mantz's "atomic-life" theory was in the form of complex mathematical formulae. (Astonishing#5/5) - The World Organization of Atomic Research (WOAR) contacted Professor Horace Grayson (who was living amongst the Eternals of Uranus), requesting that he come to their headquarters to pick up the papers on Mantz's theory and study them. But because of his age and the fact that he could not survive the rigors of space travel, Grayson sent his son Bob (Marvel Boy) in his place to pick up the documents. Marvel Boy departed for Earth in his Silver Bullet spacecraft, with a stowaway on board -- the young female Uranian, Lilli. After landing on Earth and discovering Lilli, Marvel Boy told her to stay put while he went to the WOAR building to get the secret plans. (Astonishing#5/5 - BTS) - "The Chief" and his gang landed on Uranus and took Professor Grayson hostage; meanwhile on Earth, his human operatives kidnapped Lilli. (Astonishing#5/5) - After getting the plans, Marvel Boy returned to his ship and found Lilli gone -- only her brooch (which she'd never willingly leave without) was left behind. Radioing back to Uranus, Marvel Boy learned of his father's disappearance. Seeing a greater emergency back home, Marvel Boy flew back to Uranus while his contacts in the FBI searched for Lilli. When the unique Uranian youth returned home, he was captured by Maya and Nigot and brought before "The Chief," who demanded the papers and threatened Professor Grayson's life -- but Marvel Boy no longer had the papers, as he had memorized them and destroyed them earlier. Marvel Boy bluffed and told "The Chief" he would write down the formulae if he untied his hands -- then the young crusader fired a blinding flash from his wrist bands at the space-gangsters and captured "The Chief". He then flew back to Earth to free Lilli from "The Chief's" human henchmen while the Uranian members of the gang were rounded up. Comments: Created by an unknown writer and Bill Everett. This story ("The Deadly Decision!") 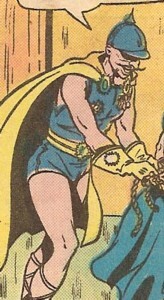 was reprinted in Marvel Super Action#4 (November, 1977). 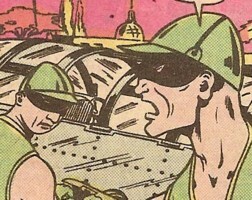 "The Chief" was never referred to as anything else but that in this story, and the whole group was only referred to as "space-gangsters" by Marvel Boy. Since Maya, Nigot, and "The Chief" were pink-skinned and wore militaristic uniforms, and they were associated with a pair of blue-skinned goons, I wonder if maybe they all could somehow be affiliated with the Kree Empire -- perhaps they were mercenaries sent to investigate the former Kree outpost on Uranus which became the home of the Uranian Eternals (as seen in What If? I#26). 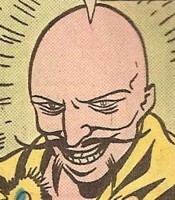 And regarding Doctor Mantz's "cosmic atom, atomic-life" theory -- could he have possibly discovered something along the lines to the cosmic energy experiment once performed thousands of years ago by the Eternal Kronus (which disintegrated him and transformed him into a cosmic entity, while it endowed the Earth-bound Eternals with increased powers (as seen in What If I#24)? Two of "The Chief's" human henchmen on Earth, they held Lilli as a hostage. Two of "The Chief's" alien henchmen on Uranus (race unknown, basically humanoid), they captured Marvel Boy when he returned from Earth. Two of "The Chief's" alien henchmen on Uranus (race unknown; unclear which was which), they held Professor Grayson hostage. They were blue-skinned bulky humanoids (possibly from a heavy-gravity planet? ), and acted as "The Chief's" enforcers/hired-muscle.